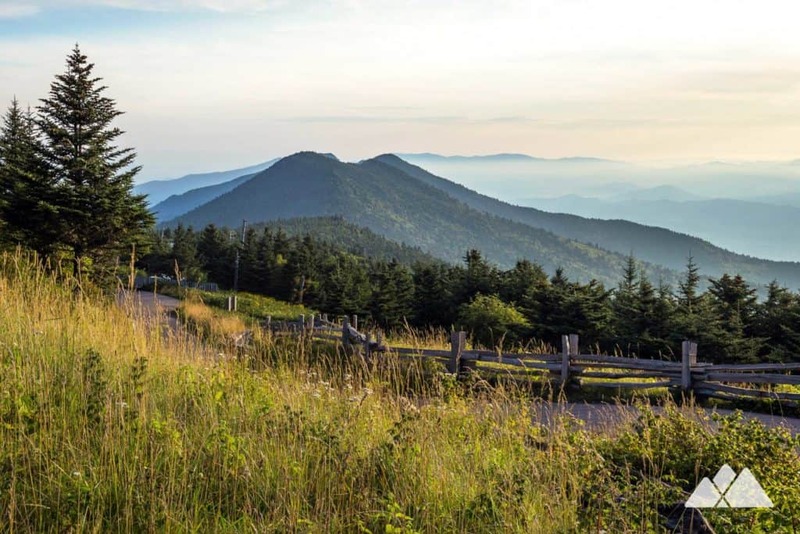 Towering above the surrounding landscape, Mount Mitchell rises high from the crest of the Black Mountains. The highest summit east of the Mississippi, the mountain’s soaring 6,684-foot height is home to harsh elements, unique ecosystems and, on clear days, some of the most spectacular views in western North Carolina. Sure – you can drive to the near-peak of this towering mountain, following a quarter-mile, paved path to the summit’s observation platform on the Summit Trail. This hike takes the longer, more scenic route, exploring a four mile stretch of beautiful high-elevation forest, wildflower-filled meadows, and fragrant stands of fir in the mountain’s shadow. 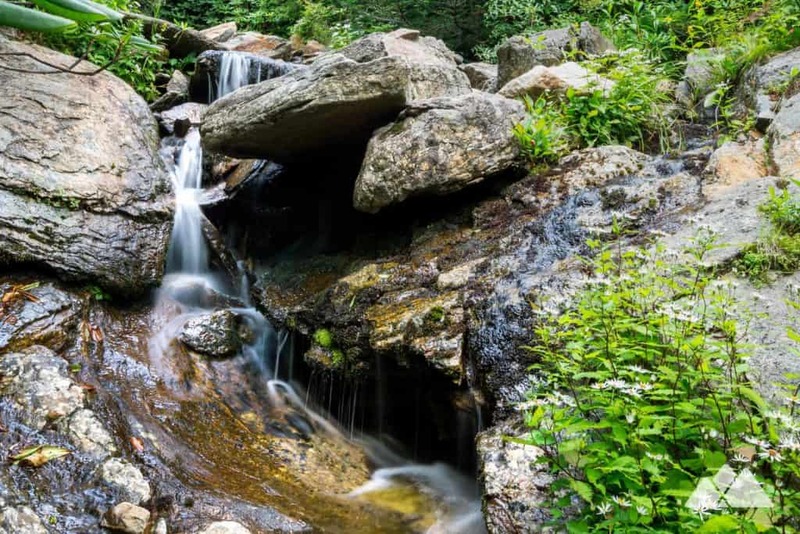 The hike follows the Old Mitchell Trail to the mountain’s summit, and then looping back to the trailhead on the Camp Alice and Old Commissary Trails, visiting a small, tumbling waterfall. Also called the ‘Mount Mitchell High Loop’, this trio of trails follows a lesser-traveled route, though crowds at the summit are frequent. Our favorite time to hike this loop is in the early morning when the sun’s rays are golden and the summit’s crowds are sparse. With incredible sunrise views, drifting fog banks and exceptionally beautiful forest, this loop is well worth the mileage. The hike departs from the Old Mitchell trailhead (view maps and driving directions), meandering northeast through a forest of fragrant balsam fir. The trail’s surface is rocky and rooty, running through alternate stands of fir and open, grassy expanses of wildflowers and wild berries. The trail rolls elevation over Hallback Mountain, following yellow trail blazes and descending to the park’s restaurant. 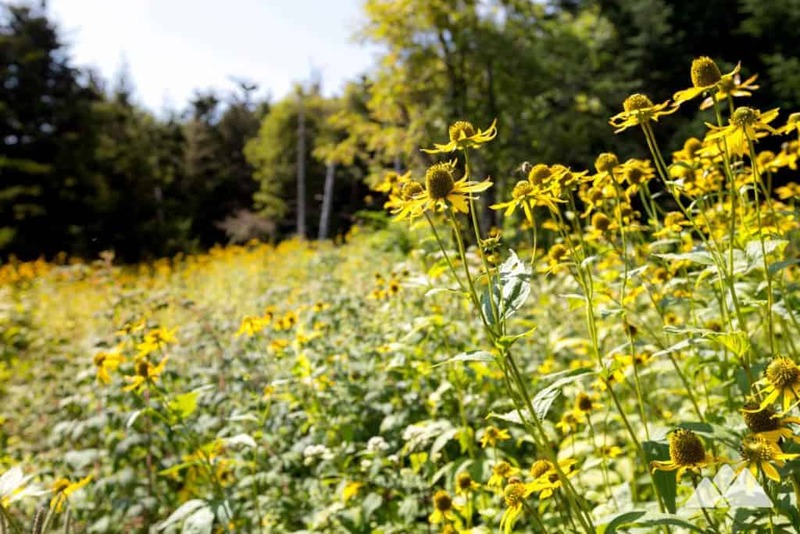 After crossing through the parking area, the trail dives back into the high-elevation forest, descending through switchbacks through a rocky, boulder-studded forest and fields of wildflowers. The hike dips through a power line clearing at 1.1 miles after crossing a wooden bridge, catching limited views from the clearing. The trail bed becomes increasingly rockier as the hike begins its ascent to the summit, climbing wooden stairs and boulders in a lush, shady forest. The trail meets an intersection with the Camp Alice Trail at 1.4 miles, veering left to begin the final climb to the summit. Reaching the paved Mount Mitchell Summit Trail at 1.7 miles, the hike hangs a right, spiraling toward the summit and catching exceptional, 360-degree panoramas from the observation platform. The hike departs the summit, retracing the Summit Trail and Old Mitchell Trail to return to the Camp Alice trailhead. The route turns left on the Camp Alice Trail at 2.3 miles, descending through switchbacks and carving through stands of young pine and a mossy, fragrant balsam forest. The sound of tumbling water fills the forest as the trail parallels Lower Creek. A small waterfall cascades near the trail at 2.7 miles, just as the Camp Alice Trail intersects the wide, gravel roadbed of the Commissary Trail. 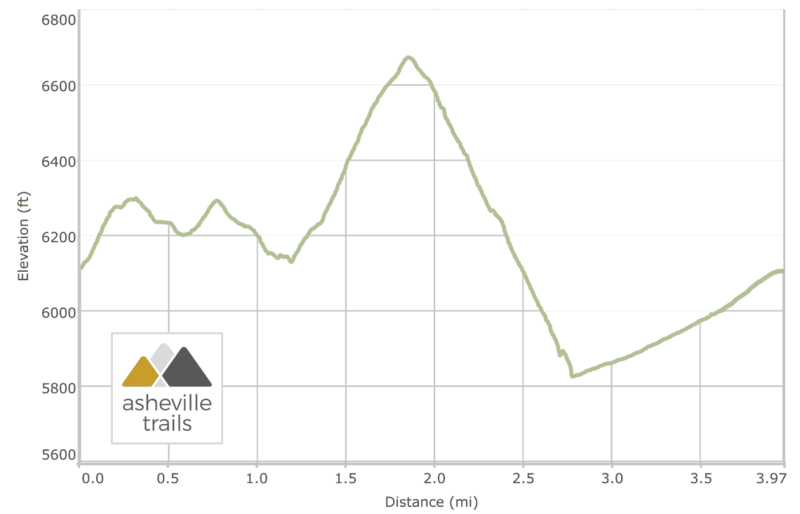 The hike turns right, following the Commissary Trail southbound in a gentle climb. Wildflowers stretch skyward along the old gravel roadbed, basking in the abundant sunshine. In warmer summertime months, wild berry bushes line the trail with abundant fruit. The trail catches views at 3.3 miles and 3.6 miles, arcing around bends in the roadbed and veering southwest. 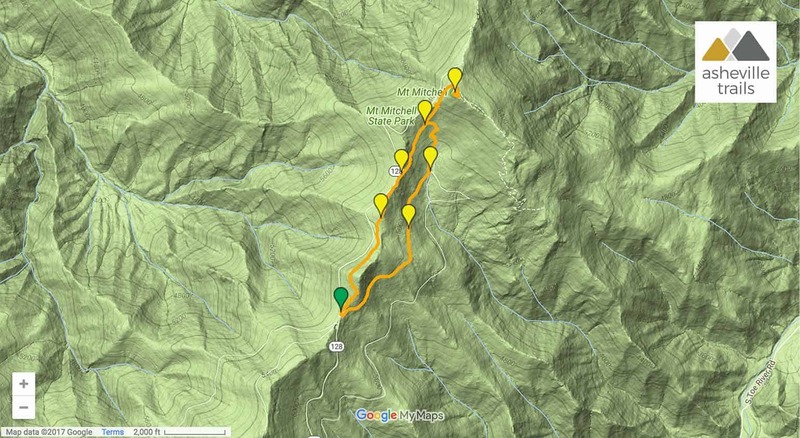 The hike reaches the trailhead at 4 miles, completing the hike. Up for more mileage at this ultra-scenic park? 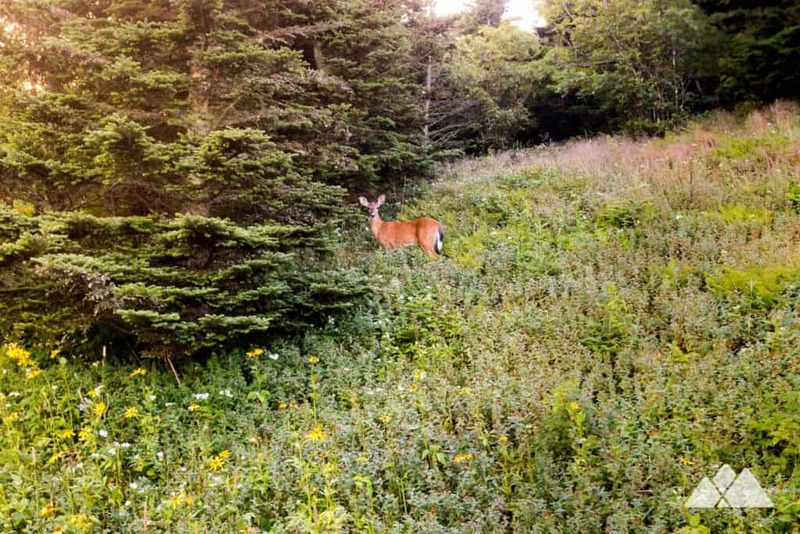 Explore the ridge line of the Black Mountains on the Deep Gap Trail, rolling elevation to Mount Craig and Big Tom, Mt Mitchell’s closest neighbors. Or hike the Balsam Nature Trail through a lush, high-elevation forest near the mountain’s summit.